We will see increasing clouds this afternoon with scattered showers for the second half of the day. 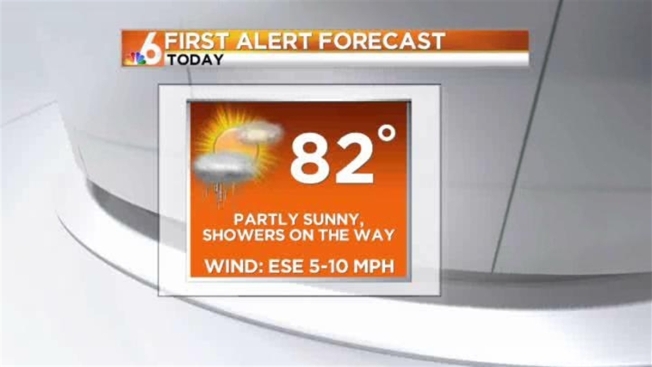 Highs will be in the lower 80s with a low risk of rip currents. Increasing moisture from the Gulf of Mexico will leave us with a gloomy and wet Sunday. Showers will be expected with a chance of an isolated thunderstorm during the day. Highs will be in the upper 70s. Lingering showers will be possible for early Monday morning but expect conditions to dry out by Monday afternoon and into the first half of the work week. Temperatures each afternoon will be in the lower 80s. A slight chance of showers could return by the end of the week.